The following two maps will be discussed in more detail in a later post, but in the meantime I thought that I would share them both as items of interest in their own right. 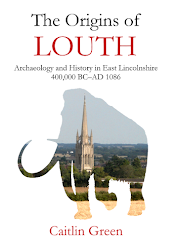 Both were initially created for and published in my The Origins of Louth: Archaeology and History in East Lincolnshire, 400,000 BC–AD 1086, but are presented here in full colour. The two maps together depict Mesolithic Doggerland. The first depicts the extent of Doggerland during the Younger Dryas period, around 10,000 BC, alongside suggested reindeer migration routes across this landscape. 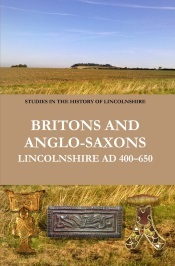 The second shows the final drowning of Doggerland as the sea level gradually rose after the end of the last 'Ice Age', from the perspective of Lincolnshire and the Fens. With regard to the latter, I particularly like how the shape of Lincolnshire emerges as the land floods over the millennia! 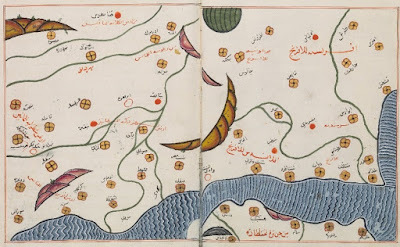 You can click both maps to access larger-scale versions of the images. 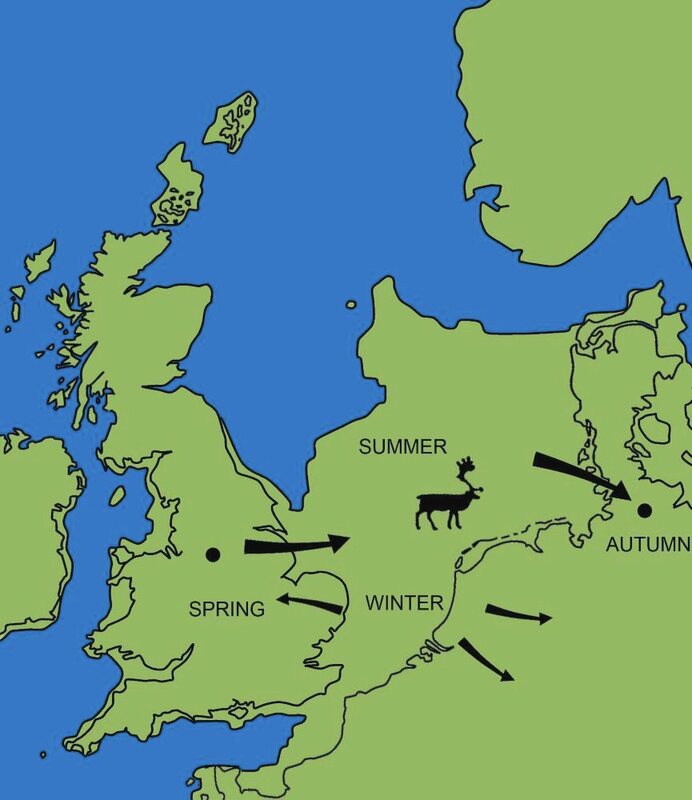 Suggested reindeer migration routes and the extent of Doggerland about 12,000 years ago at the end of the last glacial era (drawn by C. R. Green for Origins of Louth, based on Barton, 2005 and Shennan et al, 2000, with permission). 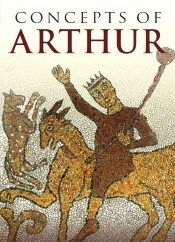 Ahrensburgian tanged points, or arrow tips, of this period have been found in north Lincolnshire, which are identical to finds associated with reindeer hunting in northern Germany then. 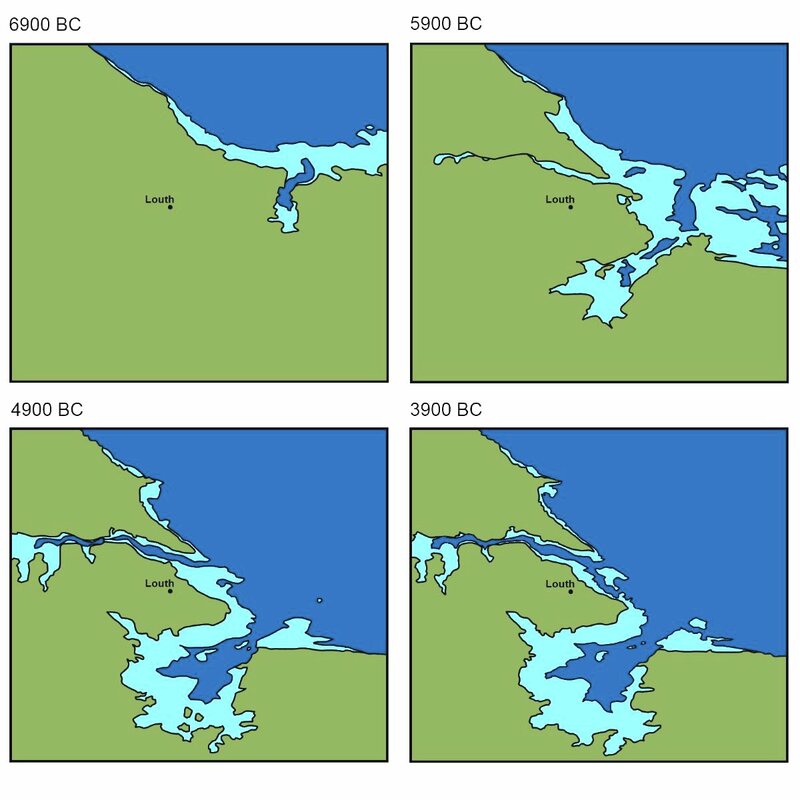 The last stages in the drowning of Mesolithic Doggerland, from the perspective of Lincolnshire and the Fens (drawn by C. R. Green for Origin of Louth, based on Shennan et al, 2000, with permission). 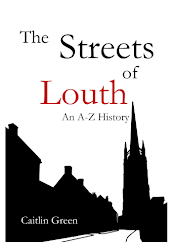 Louth is marked to help in understanding the changes; darker blue indicates areas permanently under water, light blue areas flooded by the tides and low-lying marshland.